I have another great news to share today. Certiport , a Pearson VUE business, the leading test delivery solution provider for the global workforce and academic markets, announced the 2013 Microsoft Office Specialist World Champions in Microsoft Word, Microsoft Excel and Microsoft PowerPoint, culminating the most popular technology skills competition on Microsoft Office since its inception in 2002. 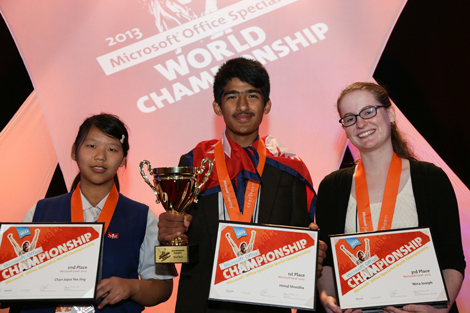 The 2013 Microsoft Office Specialist World Championship attracted more than 344,000 unique candidates from 90 countries who competed to demonstrate their mastery of Microsoft Office products. 100 student finalists participated in the final round of competition. And the winner is Himal Shrestha from Nepal won the gold medal. Certiport recognized gold medalist Himal Shrestha at the Microsoft Office Specialist World Championship Student Awards Ceremony in Washington, D.C. and presented him with a $5,000 scholarship. Chan Joyce Yee Jing received a 2,500 scholarship and Nina Joseph received a $1,000 scholarship. In the concluding round, competitors participated in unique project-based tests to demonstrate their ability to create documents, spreadsheets and presentations for the information presented in Word, Excel and PowerPoint. This entry was posted in Nepal and tagged gold medalist, Himal Shrestha, M from nepaliaustralian, Microsoft Excel 2010 World Champion, microsoft office products, microsoft office specialist, microsoft office tools, nepali australian, Nepaliaustralian, student awards ceremony. Bookmark the permalink.